[CES 2012] Ion Audio's Guitar Apprentice Is Not A Game, Is Actually Cool | OhGizmo! So we all know that Guitar Hero is over and done. It was fun, but it was just a game with a controller that had 5 buttons. Now Rocksmith is out and while it does teach you to play with a real guitar, which I think it awesome (I own the game, by the way), there’s a pretty steep learning curve involved. Not the least of which is playing with metal strings which ends up shredding the tips of your fingers. And that’s just the tip of the iceberg. But bridging the gap between useless toy and overly complex real instrument learning, there’s Ion Audio’s Guitar Apprentice. 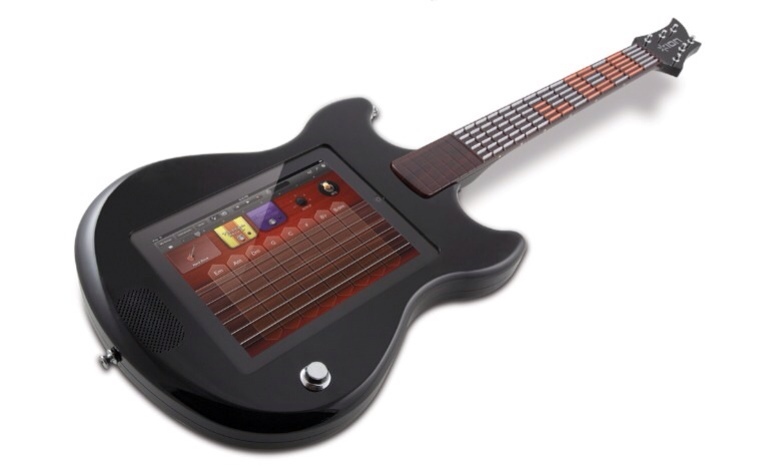 It’s a guitar shaped dock for your iPad that features a 14 fret board, with buttons replacing the strings. It’s not a full fretboard, but it’s not that far off which means you can actually play thousands of songs with no problem. The buttons work in conjunction with an app that progressively teaches you how to play by lighting up the appropriate buttons. The company is currently working on licensing songs and the device should be released sometime in Q2 for an undisclosed price. At least not officially, but one rep did tell me somewhere in the vicinity of $100. I think a real electric guitar would give justice to your money if you are just looking for a guitar.